The Solar Radiation and Climate Experiment (SORCE) is a NASA-sponsored satellite mission that is providing state-of-the-art measurements of incoming x-ray, ultraviolet, visible, near-infrared, and total solar radiation. 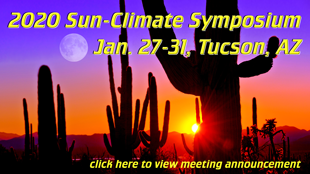 The measurements provided by SORCE specifically address long-term climate change, natural variability and enhanced climate prediction, and atmospheric ozone and UV-B radiation. These measurements are critical to studies of the Sun; its effect on our Earth system; and its influence on humankind. The SORCE spacecraft was launched on January 25, 2003 on a Pegasus XL launch vehicle to provide NASA’s Earth Science Enterprise (ESE) with precise measurements of solar radiation. It launched into a 645 km, 40 degree orbit and is operated by the Laboratory for Atmospheric and Space Physics (LASP) at the University of Colorado (CU) in Boulder, Colorado, USA. It will continue the precise measurements of total solar irradiance (TSI) that began with the ERB instrument in 1979 and has continued to the present with the ACRIM series of measurements. SORCE will also provide the measurements of the solar spectral irradiance from 1nm to 2000nm, accounting for 95% of the spectral contribution to TSI. SORCE carries four instruments including the Spectral Irradiance Monitor (SIM), Solar Stellar Irradiance Comparison Experiment (SOLSTICE), Total Irradiance Monitor (TIM), and the XUV Photometer System (XPS).